Disney’s vacation packages let guests customize their vacation package and choose the recreation, ticket, and dining options to create a dream vacation. Guests can choose vacation options that will save time and money; creating a truly personalized vacation! In addition, when guests choose a Disney Package, they can add one of Disney’s Dining Packages which offer guests the opportunity to save on the cost of dining. It also offers guests the opportunity to pay for their dining in advance and experience a more “all inclusive” vacation. Disney Dining Plans are available only as part of a package including a Walt Disney World Vacation Package and must be purchased in advance. Minimum requirements are at least a 3 night stay at a Disney owned resort. The Dining Plan must also be purchased for everyone listed on the package, except for children under the age of three. Note – Disney Dining Plans are unavailable for Guests under the age of 3, but they may share from an adult plate at no extra charge, or an additional meal may be purchased from the menu. The price of the meal will be added to your bill. For a FREE no-obligation vacation quote, contact our sponsor The Magic For Less Travel, an Authorized Disney Vacation Planner. Their concierge services are provided free of charge and their expert planning advice will help you make the most of your vacation time and money. Three Disney Dining Plans are available. Choose the perfect one for your touring style! Offers 2 Quick Service meals, 2 snacks per person per night of the package stay, plus 1 Resort Refillable Drink Mug per person, per package. Quick Service Meals include 1 entree and 1 non alcoholic beverages (Or for those over 21, one alcoholic beverage). Note- The non alcoholic beverage that comes with the quick service meal may be substituted for any item that is an eligible snack at the location (this comes in handy when eating at the resorts and using your refillable mugs). Offers 1 Table Service Meal, 1 Quick Service Meal and 2 snacks per person per night of the package stay, plus 1 Resort Refillable Drink Mug per person, per package. Table service meal for breakfast includes one entree and one non alcoholic beverage (Or for those over 21, one alcoholic beverage) OR 1 buffet or family style meal, for lunch and dinner includes 1 entree, 1 dessert and one non alcoholic beverages (Or for those over 21, one alcoholic beverage) OR 1 buffet or family style meal. Substitutions may be available in place of the dessert option, check with your server. Quick service meal includes 1 entree, and 1 non alcoholic beverage (Or for those over 21, one alcoholic beverage). Offers 3 meals (Table Service or Quick Service) and 2 snacks per person per night of the package stay, plus 1 Resort Refillable Drink Mug per person, per package. This package offers the most opportunity for savings and also includes the most food. Table service meal for breakfast includes one entree and one non alcoholic beverage (Or for those over 21, one alcoholic beverage) OR 1 buffet or family style meal, for lunch and dinner includes 1 appetizer (appetizer included on on the Deluxe dining plan only), 1 entree, 1 dessert and one non alcoholic beverages (Or for those over 21, one alcoholic beverage) OR 1 buffet or family style meal. Substitutions may be available in place of the dessert option, check with your server. Quick service meal includes 1 entree, and 1 non alcoholic beverage (Or for those over 21, one alcoholic beverage). Using one of the Disney Dining Plans is very convenient, as dining plan credits are loaded onto a guests’ MagicBand. Guests simply present their band to the cast member to “pay” for the meals using the dining plan, and dining credits are subtracted from the available credits. Meal usage will be tracked electronically and each time the dining plan is used, a receipt will indicate remaining meal credit balances. Guests can also visit a hotel lobby concierge at any time to check a meal plan balance. Each member of your party has their own MagicBand, this makes the dining plan especially convenient for groups traveling together or parties with older children who may want to have some independence during the vacation. This allows each guest to have access to their meal credits by simply using their MagicBand. Choose the plan that works for you and choose how to use your dining credits. Guests can use meals and snacks credits in any combination until the total allotment of entitlements are depleted. Use 3 meal credits one day, 1 meal credit the next and all of your snacks the third day. You decide! Most “single serve” food items at resort grab ‘n’ go markets, carts, kiosks, quick-service and select merchandise locations across property can be purchased with a snack credit. All ice cream novelties and 1- or 2-scoop ice cream offerings not served in a souvenir container qualify as snacks, including sundaes. All single serve non-alcoholic beverages not served in a souvenir container also qualify. You can even find confections in merchandise shops, bakeries and candy stores that will qualify. It never hurts to ask. Snack credits can also be used to purchase samples at international stands around World Showcase during the Epcot Food & Wine Festival. Look for the Disney Dining Plan Snack Symbol to identify snack items available with Disney’s Dining Plan snack credit. Note: Pre-bagged popcorn of any kind is not included in the Dining Plan. Another advantage of Disney’s Dining Plans is the fact that you pay for this option in advance. Many guests report that it is a huge advantage to arrive at their vacation destination with the majority of their vacation expenses paid in advance. The cost of Disney Dining Plans is included in the package price and the entire package is paid for before the guest arrives. Disney’s Dining Plans must be purchased prior to arrival. Many guests ask if they can save money by using one of Disney’s Dining Plans, and with a little planning, the potential for savings is great! Like with anything else, you need to do a little research to make the plan work for you. Dining can be one of the more expensive components of a vacation, and now you have the opportunity to save by using one of the dining plans. Let us show you how you can save using Disney Dining Plans. To help you decide if you can save, we have created some scenarios that show how visitors can save using one of Disney’s Dining Plans. Visit our Best Value for Quick Service Restaurants page for a list of best value on the Disney Quick Service Dining Plan as well as our Best one Table Service Credit Value Restaurants page for a list of the best value on the Disney Plus Dining and Disney Deluxe Dining Plans. Disney’s Dining Plans are available to guests staying at a Disney Resort booking a Disney Vacation Package (a reservation including accommodations and other options). Guests staying at The Dolphin, The Swan, Shades of Green and Downtown Disney resorts are not able to add one of Disney’s dining plans to their reservation. Special Disney vacation packages without tickets that include Disney’s Dining Packages are available to Walt Disney World Annual Passholders. Plus, Florida Residents have the option of purchasing a vacation package that includes discounted Florida Resident tickets and the option to add one of Disney’s Dining Plans. There is also a package available to the general public that includes resort accommodations, a dining plan, but no ticket. Ask your Disney travel agent to price out a room plus dining package. Advance Dining Reservations are highly recommended at many of the participating table service restaurants. To book Advance Dining Reservations, call 1-407-WDW-DINE. The dining plan starts as soon as you check into your resort and get your MagicBand. Even if you can’t check into your room right away, you can start using your dining credits immediately. Any credits that are not used by midnight on the day of check-out are lost. Table Service entitlements can be used by your meal “guests” who are not included on your Disney Dining Plan. Example: A party of 4 guests on the Disney Dining Plan could use 1 additional entitlement for a guest in that party – making a total of 5 entitlements used for the group of 5 diners. • Guests may use their table service credits in a Quick Serve location; however, Guests may not use their quick service credits in a table service restaurant. • A dessert or beverage from the Quick Service Meal credit can be substituted for any snack item on the menu within the same order. • At Quick Service locations, child meal credits can be used for an adult meal. • At select table service locations only, a dessert may be substituted for a side salad, soup or fruit plate if available. • If using the Deluxe, Premium and Platinum Plans, a child table service credit can be used to choose an adult entree. Please note those on the regular Disney Dining Plan with table service credits must use a child credit to order a child meal. • 2 Table-Service meal credits per person may be exchanged for one of the following: 1 Signature Dining Experience; 1 Disney Dinner Show (category 2 or 3 seating; category 1 at last show of the evening); 1 Cinderella’s Royal Table Experience; or 1 In-Room Private Dining meal. • Any leftover Snack entitlements can be used to purchase drinks and munchies for the trip home. Don’t forget, you leftover meal credits can be used to purchase snacks too, with some restrictions (see above). At Table Service restaurants, 18% gratuity will be added automatically for parties of six or more dining at Disney’s Table Service restaurants. A gratuity may also be added automatically on items you order that are not covered by your dining plan (e.g. alcoholic beverages). Automatic tips will be added to your resort bill for payment upon checkout. Parties of less than six can leave tips at the restaurant in percentages of their choosing. Special dining events with special menus offered at certain table-service locations may not included in the Disney Dining Plan. 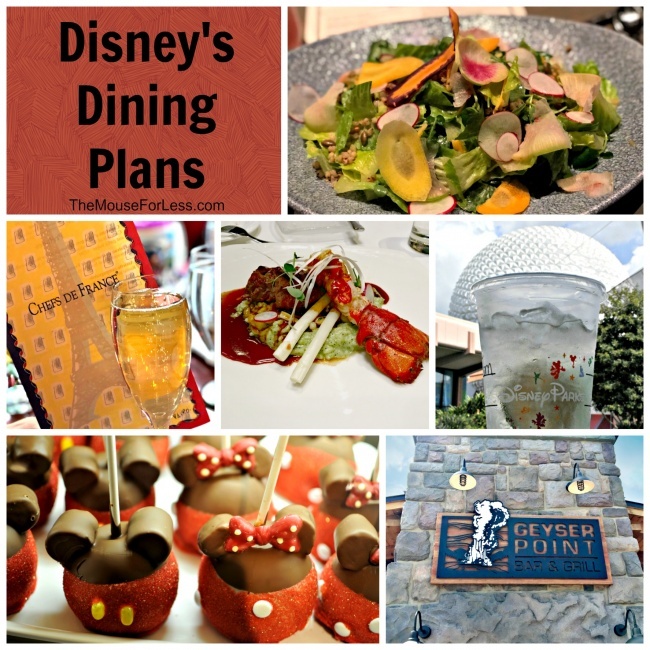 The Disney Dining Plan is occasionally offered for free as a part of a Walt Disney World vacation package. Check here to see if it has been offered during your preferred dates in the past. Disney Dining Plans are not available for children under three. Children (aged 3-9) must purchase the child’s dining plan and in many cases, order from the children’s menu when available. Adults (age 10 and over) must purchase the adult plan. Refillable mugs are valid only during package stay at Quick-Service locations at your Disney Resort hotel and have unlimited refills during your stay. Mugs are not refilled in theme parks. Merchandise or photo imaging products that “may” be offered at select character meals are not included. Merchandise such as special souvenir cups and glow cubes are not part of the dining plan. TheMouseForLess Tip: Always check to see if a tip has been added to your bill and be sure not to tip twice. We’ve heard reports from guests who did not realize they were tipping twice or were surprised to see automatic gratuities show up on their final bill when checking out of their resorts. If you have additional questions about Disney’s Dining Plans, we suggest that you book your trip with an Authorized Disney Vacation Planner like The Magic for Less Travel, the official travel agency of The MouseForLess. The Magic for Less Travel has been designated by Disney as an Authorized Disney Planner. Their exclusive Magic Plus Concierge Service is provided free of charge. This service ensures that you will get the best service and the best pricing. Agents working with The Magic for Less Travel are happy to help you secure Advanced Dining Reservations and help you create the vacation of your dreams. Please note Premium and Platinum packages have been discontinued for 2017.